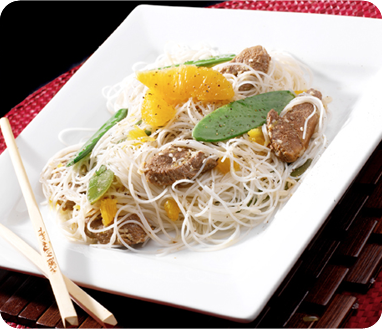 Duck with rice Noodles and Orange - Mehadrin Tnuport Export L.P.
Marinate the duck breasts in the orange juice and the soy sauce and set aside covered. Then cook the rice noodles in a large saucepan with boiling salted water for 3-4 minutes, or according the pack instructions. Drain the noodles. In a preheated wok over medium high heat, wok-fry the duck with the marinade for 1-2 minutes until it is seared. Then add the snow peas and sesame seeds and stir-fry for another 4-5 minutes. Add the noodles to the wok while stirring, then add the beaten eggs and stir again until the egg is well cooked and evenly spread. Add the sesame oil, some salt and fresh ground black pepper, and serve immediately.